Beautify CNMI! : More Mt. Tapotchao Pictures! MOVER/FMI and other BC volunteers way up at the top. Joe Itibus from Rep. Frank Dela Cruz's Office stopped by to bring us water. Thank you!!! Jesse Sablan and other BC volunteers kicking up dust as they hunt down litter! That's our good friend and visiting dignitary from American Samoa, Mr. Abe Malae, with Juanita Fajardo and Adam "Young Evironmental Warrior" Sablan. By the way, this is not Abe's first Beautify CNMI event. 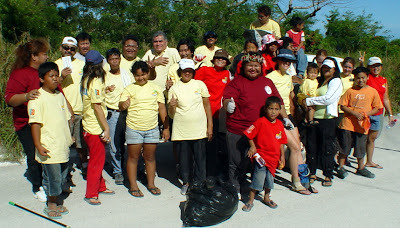 He was part of Leutenant Governor Tim Villagomez's team who participated in the mega-successful "1020 on 10/20" island-wide clean-up which took place in October of 2006. Thank you, Abe! And thank you, also, for being our second on-line donor! Ah, yes...this is most of the crew. The smile of satisfaction for a job well done!